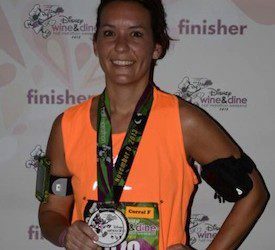 Stephanie Tomko poses after completing the Disney Wine & Dine Half Marathon. Stephanie Tomko was diagnosed with Type 1 diabetes when she was four years old. Today, she is a mother of two “awesome” kids, a distance runner, and the creator of the blog “Type 1 and Running.” She is also this week’s positive role model! AM: You have lived with diabetes for more than three decades. Do you feel like you’re an expert or are you still learning? ST: There are days when I feel like I have diabetes completely under control and days when I’m frustrated and disappointed in the numbers. After 35 years with this disease I’ve learned that it’s a commitment, and even the strongest commitment falls short sometimes. I always try to remind myself that just because today was bad doesn’t mean I wasn’t trying, and if I really wasn’t trying, then I need to step it up and regain my focus. AM: How old were you when you began running and how do you manage your exercise with diabetes? ST: I started running when I was in my early 30s. I’ve always been motivated by challenges. If you tell me I can’t do something, I will work 10 times harder to prove you wrong. Anything I’ve accomplished physically has always been at least partially motivated by the idea of beating diabetes and proving that I can control it. If I could run a half marathon and not die, it was proof to me that I was in control, right? Wrong. After my first race in 2013, I knew that finishing the race didn’t prove as much as the commitment to train and work toward that goal. Whether you are running or biking or walking, a person with Type 1 diabetes trains harder because there are more details, more planning, and more failure than the average athlete. Any person with Type 1 who accomplishes a physical challenge should be really proud of themselves. AM: Tell me about your running: goals, training, preparation, etc. How do you manage blood sugars? Do you use a CGM (continuous glucose monitor) and if yes, how does this help with running? Any advice for fellow diabetic runners? 1. When you are training, try to run at the same time that the race is going to be. My blood sugar behaves differently in the morning (dawn effect) than in the afternoon, so I want to be able to get as close to race day times as possible. 2. Cut your basal a few hours before your run so you don’t start falling into mile 2. 3. If you are going to eat and your stomach can take it, wait until right before the race starts. I ate a couple of hours before my race and my basal was already lowered. This caused my blood sugar to go up quickly. If I had waited until right before I started running, the activity would have balanced the carbs. 4. Learn a protocol for your CGM and don’t panic. You can always stop if your blood sugar is off. There’s always another race. 5. Be proud of yourself no matter what. This diabetes stuff isn’t easy. AM: You’ve been blogging for six years, is that right? Why did you start and what is your goal with the blog “Type 1 and Running”? ST: I started blogging because for so long I felt like I was managing this disease by myself. My sister also has Type 1, and if it wasn’t for her I can’t image the isolation I would have felt. Blogging immediately opened up an entire community of people who thought the same things I had thought for years, joked about the same things I had joked about, and understood how it feels to live with Type 1. While my blog activity goes up and down based on all of the other priorities in my life, my goal is to continue to connect with people and show them that this disease is a big deal and so are all of the ways that we work to live with it. AM: You are a mom, right? Tell me about managing kids, work, and diabetes. Do you find it challenging to keep all the balls in the air? ST: I’m a mom of two awesome kids (10 and 7 years old). Diabetes is the easiest thing to push to the side when life gets really hectic. It’s also the worst thing to push to the side for obvious reasons. I have always found that when I put Type 1 first, even when I don’t want to, the rest of life is more manageable. There’s nothing more frustrating then having to step away from a teacher meeting or a sporting event because my blood sugar is low due to not paying attention. You can’t ignore this disease because it will always, eventually, force you to remember. It’s taken a long time for me to be able to tell people that I need to test or get something to eat. When I was younger, I didn’t want people to know that I wasn’t “normal” so I would power through low blood sugar and act like everything was OK until I was alone and could treat it. Now I’m comfortable talking about it, my kids know what it means when my blood sugar is low, and I’m OK with not being like everyone else. What is polycystic ovary syndrome (PCOS), and what can you do about the condition? Bookmark DiabetesSelfManagement.com and tune in tomorrow to find out from nurse David Spero.